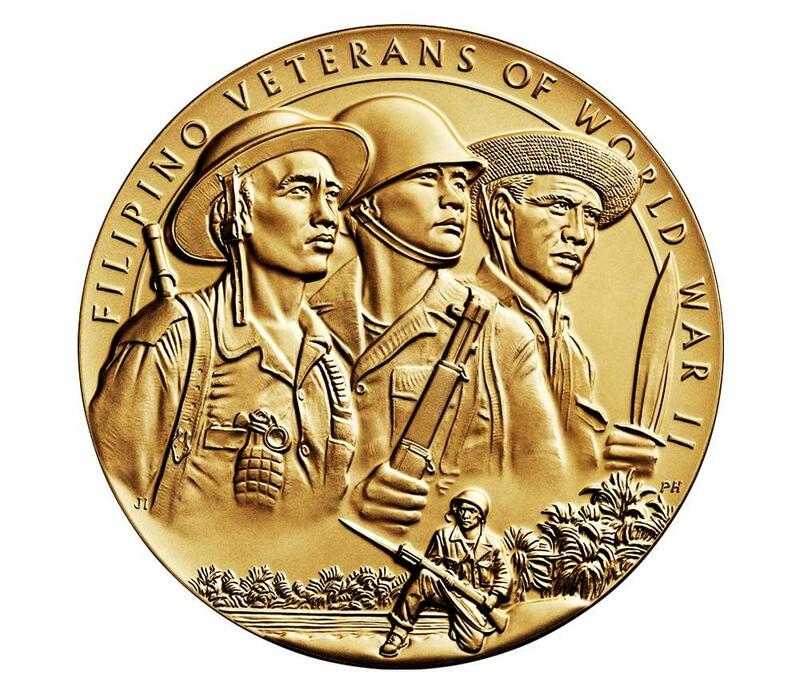 WASHINGTON – Filipino veterans of World War II received a Congressional Gold Medal today during a ceremony in Emancipation Hall of the U.S. Capitol. It was awarded collectively to those who served honorably in an active-duty status between July 26, 1941, and December 31, 1946, under the command of the United States Army Forces in the Far East (USAFFE) within the Philippine Commonwealth Army, the Philippine Scouts, the Philippine Constabulary, recognized guerrilla units, the New Philippine Scouts, the First Filipino Infantry Regiment, the Second Filipino Infantry Battalion (Separate), or the First Reconnaissance Battalion, including those commanding or serving as U.S. military officers or enlisted soldiers. Filipino, Filipino-American, and American soldiers defended U.S. sovereign territory under USAFFE command after President Roosevelt’s call-to-arms in July 1941 to address rising tensions with Japan in the Pacific. Their valiant service was an integral part of the Allied victory over Axis forces in World War II and demonstrates a highly uncommon and commendable sense of patriotism and honor. The medal was designed and struck by the United States Mint, as authorized by Public Law 114-265. 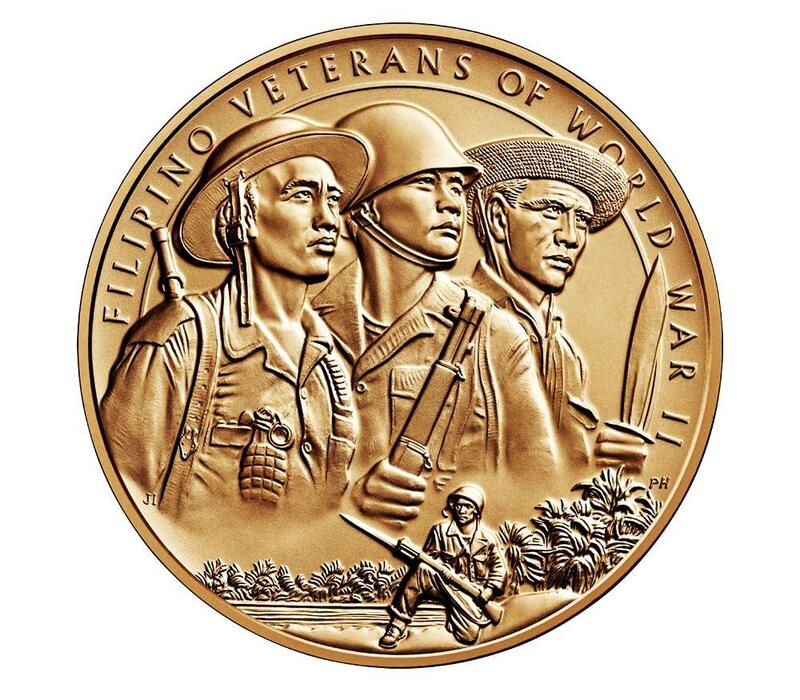 Its obverse displays part of the range and breadth of the Filipino veterans’ service in World War II. Depicted are a Filipino scout, a Filipino infantry regiment officer, and a guerrilla soldier. In the foreground is an infantryman on guard, symbolizing the soldiers’ fierce determination. The design features the inscription FILIPINO VETERANS OF WORLD WAR II. Artistic Infusion Program (AIP) designer Joel Iskowitz created the design, which was engraved by Mint sculptor-engraver Phebe Hemphill. 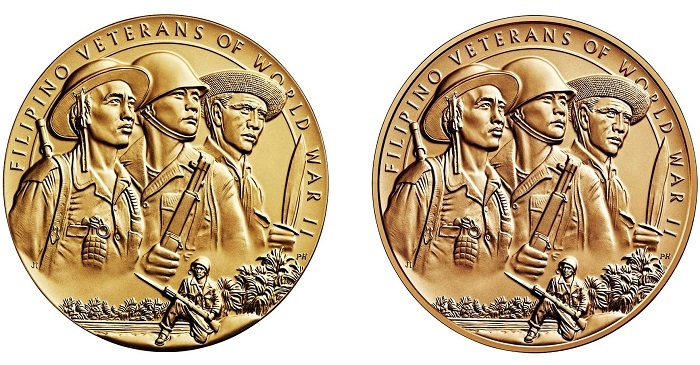 The medal’s reverse displays both the American and Filipino World War II–era flags. UNITED STATES ARMY FORCES IN THE FAR EAST is inscribed along the top border of the design. 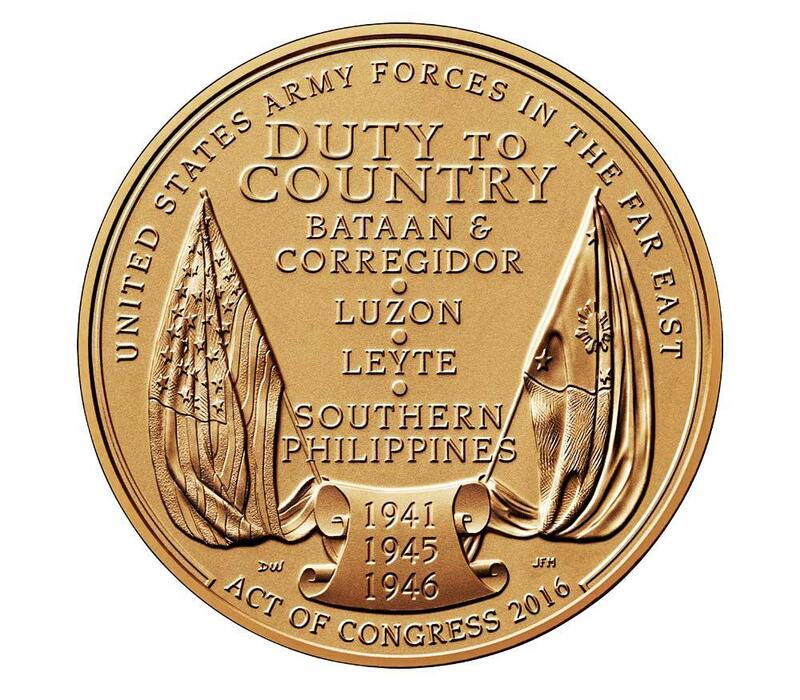 The inscription of DUTY TO COUNTRY and the key locations of BATAAN & CORREGIDOR, LUZON, LEYTE, and SOUTHERN PHILIPPINES are featured centrally. ACT OF CONGRESS 2016 is inscribed along the bottom of the design. Inscribed upon a scroll between the flags are the significant years of 1941, 1945, and 1946. AIP designer Donna Weaver created the design, which was engraved by Mint sculptor-engraver Joseph Menna. 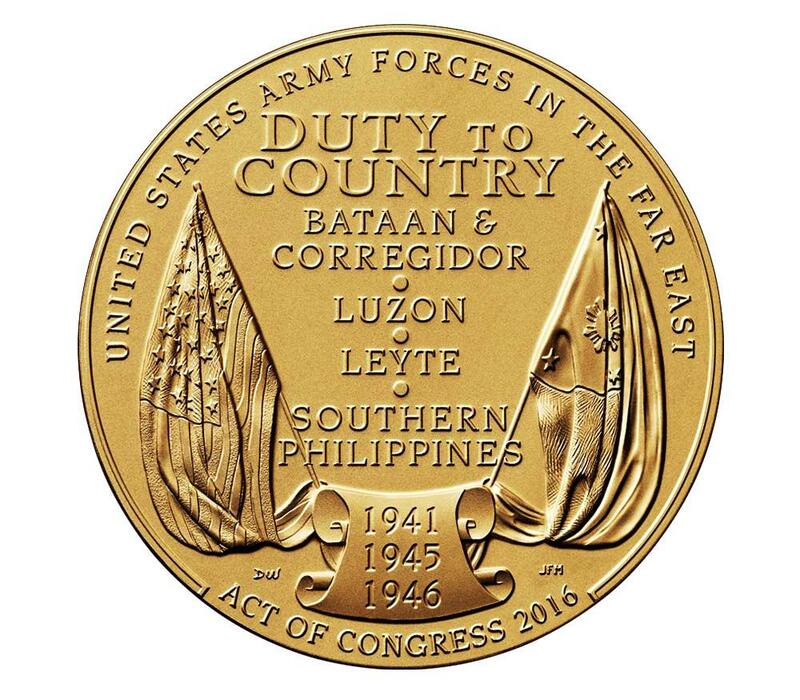 The public law that awards the Congressional Gold Medal to the Filipino veterans of World War II also authorizes the Mint to strike and sell bronze reproductions of the medal. The three-inch medal (product code 17MB), priced at $39.95, and the 1.5-inch medal (product code 17MC), priced at $6.95, will be available for purchase on October 25 at noon Eastern Time through the bureau’s online catalog and at 1-800-USA-MINT (872-6468). Hearing- and speech-impaired customers with TTY equipment may call 1-888-321-MINT (6468). The Congressional Gold Medal is one of the nation’s highest civilian awards bestowed by Congress as an expression of gratitude for distinguished achievements and contributions by individuals, groups, or institutions. Past recipients include Dr. Michael E. DeBakey, the Tuskegee Airmen, the Women Airforce Service Pilots, and Mother Teresa of Calcutta.